Archie Comics Publications' never-ending quest to generate new interest in a 67-year-old comic book character has led to such recent innovations as "the new look" and the introduction of characters from the Pacific Rim, and now continues with the most earth-shattering Archie development since Jughead pretended to give up food for girls: This August, Archie #600 begins the six-part storyline "Archie Marries Veronica." How will Betty take this news? Will Mr. Lodge be able to give his daughter away without steam shooting out of his ears? Will the now grown-up characters stop enjoying every fleeting fad in popular culture? 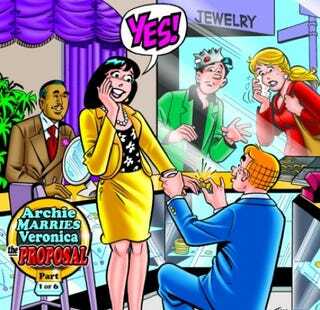 Will Archie and Veronica, y'know, do it? Stay tuned this fall for further details.